Today we are going to learn a topic called sag and tension in the transmission lines.During the erection of overhead transmission line, the conductors are connected between two tower structures. The conductors connected between the tower structures must not be connected too tight or too loose. If they are connected very tightly, the tension on the conductor will be very high and at some point it may break. 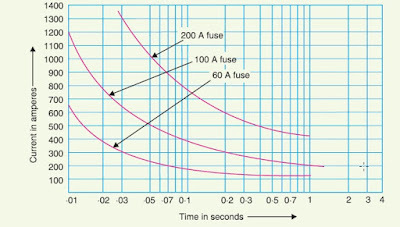 If they are connected very loose, the charging current increases the length of wire to be used and the height of the tower structure increases. Hence, the conductors must be connected in such a way that the tension is minimum and at the same time there should be good clearance between the ground and the conductor. Sag can be defined as "The difference in level between the points of supports and the lowest point on the conductor is known as sag"
Hence ,sag determines the value of safe working tension and the minimum clearance of the conductor with respect to ground.The conductor sag should be kept to a minimum in order to reduce the conductor material required and to avoid extra pole height for sufficient clearance above ground level. 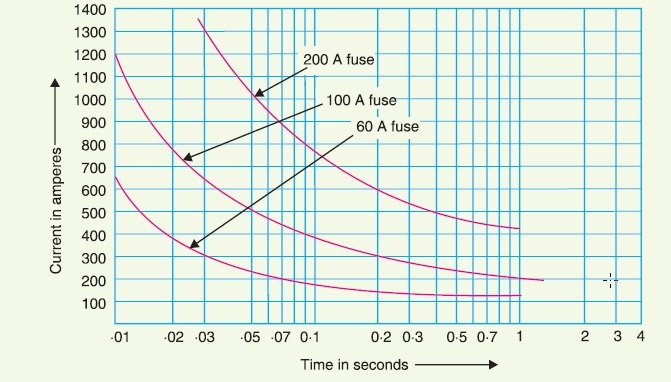 Here we discuss briefly about various factors sag & tension in electrical transmission lines . The sag of an overhead line is directly proportional to the weight of the conductor.This is because the weight of any body acts vertically downwards.i.e.,more the weight of the conductor more the force acting vertically downwards and hence greater is the sag value in transmission lines. Sag also depends on the location of conductors.If the conductors are present in area where ice formation takes place,then due the accumulation of ice on the conductor its overall weight increases.This increases the weight of the conductors which in turn increases the value of sag. Sag is proportional to the square of length of span.Hence, longer the span greater will be the sag provided the tension and weight of the conductor is constant. The value of sag greatly affected by the temperature.If the temperature is high sag will be more because rise in temperature causes the conductors to expand.Is the temperature is low, the conductor(being metallic) contracts and hence sag is less due to which the tension in the conductor is increases. Sag inversely proportional to the tensile strength of the conductor provided the other parameters are constant. Tension on the conductor is inversely proportional to sag.If the tension is more the conductors are connected very tightly between the tower structure and hence sag is less.On the other hand is tension is less the conductors are connected loosely hands sag is more. Let us consider a line conductor between two equal height line supports.Line supports are A and B with O as the lowest point as shown in figure.Point O will be the lowest point as two levels are equal lowest point will be at the mid-span. T = Tension in the conductor. (i) The weight wx of conductor acting at a distance x/2 from O. (ii) The tension T acting at O. The difference in level between points of supports and the lowest point on the conductor is called "sag".When transmission lines run on steep inclines as in the case of hilly areas, we generally come across conductors suspended between supports at unequal levels.The shape of the conductor between the supports may be assumed to be a part of the parabola. In this case, the lowest point of the conductor will not lie in the middle of the span. Consider a conductor suspended between two supports A and B which are at different levels as shown in the following figure. Having found X1 and X2, values of S1 and S2 can be easily calculated. 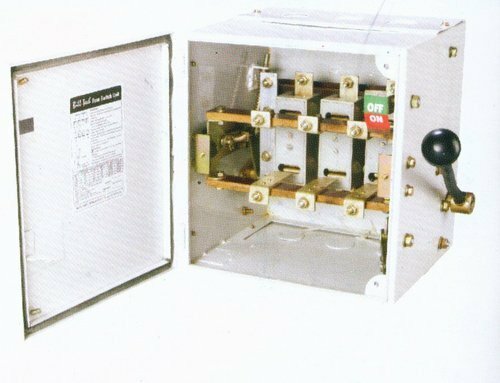 Till now the expression for sag and tension derived was under normal conditions i.e.. at normal temperature and the weight acting on the conductor was only its own weight. But in cold places there is a ice coating formed on the conductor and also wind pressure nets horizontally on the line conductor. The ice coating on the line conductor increases the total diameter of the conductor and also the weight of the Conductor increases. The total weight of the conductor i.e., both the conductor weight and the weight of the ice acts vertically downwards whereas the wind force acts horizontally on the conductor. Therefore, the vector sum of horizontal and vertical forces acting on the conductor gives the total force shown in figure. Hence S represents the slant sag in a direction making an angle θ to the vertical. If no specific mention is made in the problem, then slant slag is calculated by using the above formula. (iii) The vertical sag = S cos θ. 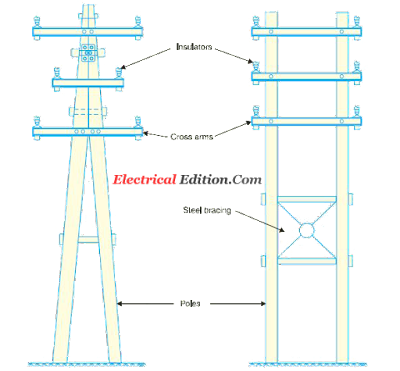 This is the complete info on sag in transmission line wiki.You can download sag and tension calculation overhead transmission lines as pdf.Share with your friends. We know most of the electrical power is distributing by overhead transmission lines.we have electrical poles to transmit and distribute different range of voltages by different types of electrical poles. 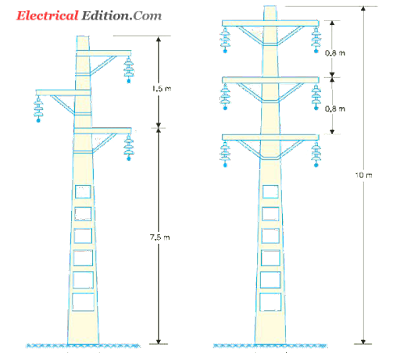 Different types of poles or towers are used to support overhead lines structures which are known as line supports. A line support should possess the following requirements. (i) It should have high mechanical strength to bear the conductor weight,wind load etc. (ii) Maintenance should be easy and cost should be very low. (iii) It Should be very light in weight and extremely durable. (iv) Proper spacing between the conductors and ground clearance must be maintained. The choice of support depends upon the cost, span of line, atmospheric conditions and line voltage. When compared to different types of line supports wooden poles are cheap and are useful for lines of shorter spans about 50 meters,best suited for rural areas.They can withstand voltage up to 132 kV When,single or H type poles ,are used whereas double pole structures of ’A or H type provide higher transverse strength and are usually used for terminal poles. 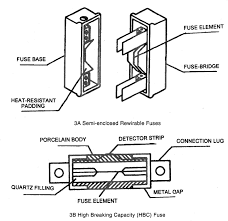 These supports are used because they are of low cost, available without difficulty, have a natural insulating property due to which lesser flashovers occur for lightning. 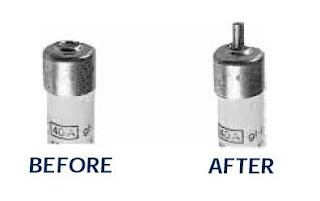 To protect it hum decay a metallic cap is provided at the top. (i)Diameter and height of wooden poles. (ii) Short span and less durability (20-25 years). (iii) Tendency not below ground level. (iv) Strength and durability can‘t be predicted with certainty. (v) Problems due to insects and birds and require. 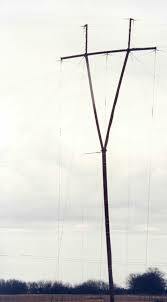 These poles are widely used because of their longer durability and are used for system 33 kV. They have greater mechanical strength, used for longer spans, longer- life and maintaining cost is very low. They also have good insulating properties am appearance. RCC pole structure is shown in figure. The drawbacks of using RCC poles is they are very heavy in weight and there are chances of damage during transportation,loading and unloading and transportation cost is high.These difficulties are overcome by. using prestressed concrete poles which are manufactured at job sites themselves and have very less weight as less material is used. Holes provided in the poles reduce their weight and make climbing the poles easier. These poles are used for distribution purposes along road sides and developed areas. 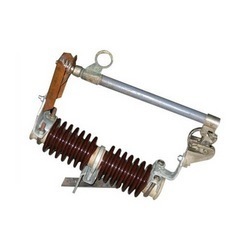 These are favoured for voltages up to 33 kV (low and medium voltages) when compared to Wooden and RCC poles, they have high mechanical strength, longer life of at least 30 years, possesses light weight but are costlier.They need to be galvanized or painted periodically to prolong its life and prevent them from corrosion and hence maintenance cost is high. They are often used as substitute for wooden poles. 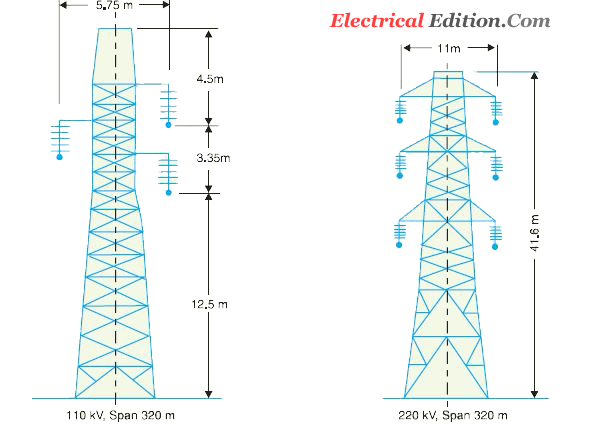 Where long span of lines are very essential,steel towers are used for long distance transmission at voltages above 33 kV,Owing to longer span, insulation cost and risk of interrupted service is reduced to a large extent. Lightning troubles and breakdowns are reduced considerably as the tower footing are grounded into the earth. These towers are made of‘ steel, have longer-life, high mechanical strength and ability to withstand severe climatic conditions. Lattice type structures are one of the most common types of self—supporting towers. 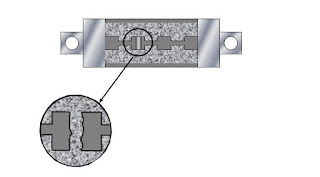 The narrow—base type employs lattice construction of channel or angle with welded or bolted connections. These are used for shorter spans. (In lattice a broad—base type only lattice construction with bolted connections are used. Each leg has a separate foundation. These are used when the span is very large. Figures shows broad and narrow—base circuit towers. -Tangent towers which are employed for straight lines. -Deviation towers are employed if the transmission line changes direction. As the self-supporting structures are mostly used in India, guyed towers are preferred in USA and Canada: Where helicopters are used for transportation of these towers at the sites which are not accessible by road or rail. Less expensive, lighter, aluminium guyed towers are favoured in areas facing transportation problems. Span between the towers is reduced, which increases reliability and reduces cost. These are of two types portal and V-type as shown in figures. Both types have two masts at the top are supported by cross-arms and have four guys.In portal type,each mast lies down on it's own foundation,where as for V-type,the two mast rest on one thrust facing each other.In portal type the four guys are attached to 2-double guys and in V-type separate guys in attached.These are supported by hinged foundation. Tags:line supports in transmission,types of poles used in transmission line pdf,types of electrical poles wikipedia.